Tractionboard is a reliable platform that allows users to track and evaluate each marketing campaign of any channel (online and/or offline) and provides users with actionable metrics so they can enhance and fully optimize every marketing campaign. With Tractionboard, users get a people-centered solution that monitors the entire lifecycle from unknown visitors to customers. The system gathers information from the major ad providers in the market, and then relates the expenses with your sources and campaigns. Tractionboard enables users to create their own growth engine by determining the marketing campaigns that are effective in attracting high value customers, resulting in quick and massive ROI. Users basically spot poor campaigns and ditch them immediately. 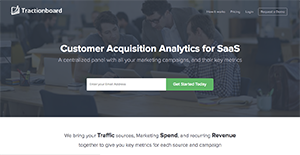 Tractionboard is 100% focused on SaaS and gives your most important acquisition metrics in just one solid platform. The system automatically gives you actionable metrics such as CAC, LTV, and ROI for all your marketing channels and campaigns. The solution is built to help you go deeper into your information, enabling you to determine which referrers, countries, and ad-creatives are getting the best results. With Tractionboard, users can monitor the entire journey from unknown visitors to customers, even if they use several devices (cross-device tracking). No longer do you have to put in manual effort with workflows and reports as Tractionboard integrates easily with your existing setup with just a click of the button. The system is centered on people. On top of that, the setup is simple and fast with its segment integration. Tractionboard lets you gather data from the major ad providers, including Adwords, Facebook Ads, LinkedIn, and Taboola, among others. Gathering and analyzing recurring revenue becomes easy as you get data from the most important payment gateways, including Stripe, Braintree, Chargify, and Recurly, to mention a few. You also receive essential information such as cancels or renovations. Tractionboard offers dedicated account support with one member of the Tractionboard assigned to your account, who helps you take care of your business by providing support to every aspect of your business, such as the onboarding process and setting up your account. Every company is different, and might need a special Campaign Management Software solution that will be designed for their company size, type of customers and employees and even specific industry they support. You should not count on getting a perfect software that will work for each company regardless of their history is. It may be a good idea to read a few Tractionboard reviews first and even then you should keep in mind what the service is intended to do for your company and your staff. Do you require an easy and intuitive app with only basic functions? Will you actually use the advanced tools required by experts and large enterprises? Are there any specific features that are especially useful for the industry you work in? If you ask yourself these questions it is going to be much easier to get a solid solution that will fit your budget. How Much Does Tractionboard Cost? We realize that when you make a decision to buy Marketing Software it’s important not only to see how experts evaluate it in their reviews, but also to find out if the real people and companies that buy it are actually satisfied with the product. That’s why we’ve created our behavior-based Customer Satisfaction Algorithm™ that gathers customer reviews, comments and Tractionboard reviews across a wide range of social media sites. The data is then presented in an easy to digest form showing how many people had positive and negative experience with Tractionboard. With that information at hand you should be equipped to make an informed buying decision that you won’t regret. What are Tractionboard pricing details? What integrations are available for Tractionboard? If you need more information about Tractionboard or you simply have a question let us know what you need and we’ll forward your request directly to the vendor.